Things have been very quiet around these parts lately. 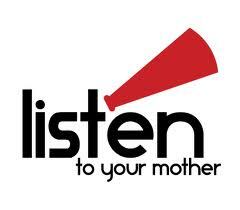 Why, because I have been frantically preparing for the LISTEN TO YOUR MOTHER SHOW!!!! And it has finally arrived. This Thursday, TOMORROW, at Thanksgiving Point, 7-9 pm in the Amber Room. 16 Women will come together to celebrate motherhood and give Mother's Day a Microphone. Will you be there to join us? The cast line up is out of this world. The monologues will make you laugh, and cry, and then laugh again. I promise it will be a night well spent. You don't have to be a mother, or a woman to appreciate the event. Men and women alike will love the content of the night. You will find yourself sitting in the audience chanting a resounding "Me Too"! As the pieces touch your heart and your spirit. You will leave feeling rejuvenated and celebrated. It would mean the world to me to have you there. And I hope you will come and introduce yourself and say hello. Are you still looking for a mothers day gift. This would be perfect. And for 10 dollars, you can't beat the price. Bring your mother, your sisters, your neighbors, and friends. Plus for today only, use code LTYM2 and get 2 dollars off your ticket. You can find full show information here. And the direct link to tickets here. Doors open at 6:15 so be sure you arrive early to get a good seat. See you tomorrow! 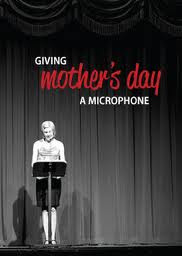 Come and help us give Mother's Day a Microphone. Wish I lived closer and could come.